Consistently rated the “best-ever” workshop on board governance at nonprofit and association conferences (average evaluations exceed 4.7 on a 5-point scale), this interactive workshop gives participants a comprehensive new look at how boards can become highly effective leadership teams. The workshop explores common board shortcomings, and provides a roadmap to excellence. Full-day version includes more interactive exercise and experiential learning. Crucial to a Board’s governance success, and of immense value to CEOs, is the ability to decipher opinions and expectations of Board members from those of the Board as a whole. Common structures, especially officer and committee roles, confuse, rather than clarify, these issues. More than ever, sound fiscal stewardship is demanded of today’s governing boards. Time-honored traditions and rituals of financial oversight often fall short, their flaws evidenced by the vast number of organizations with Board-approved budgets that still encounter financial hardship. This workshop explores how boards can effectively set standards for multiple layers of fiscal concerns, such as budgeting, actual financial condition/activities, protection of financial/physical/brand assets, and compensation and benefits. Actual examples of governing policies for: budgeting, financial condition and activities, compensation and benefits, and asset protection. One of the most difficult challenges Boards face is staying results-focused. Attention is so constantly diverted to the operational details (the “how’s”) that “the why’s” often get lost from the radar. The most powerful tool available to Boards to maintain results/outcomes focus is the (Policy Governance based) concept of Ends – defining the expected results/difference an organization is to produce, as well as the targeted recipients/beneficiaries, and defining the worth/value/priority of any of these outputs. This conference workshop explains and demonstrates the power and utility of this concept, with participants working in “mock boards” that generate, share and critique each others development of Ends policies. (Exercises and examples are tailored to be industry/sector specific for the given conference setting.) Participants leave with greater conceptual and practical grasp of how Ends differ from traditional mission/goals/objectives language as a tool for strategic and visionary board leadership. CEO Evaluation: Are We Getting What We Asked For? A key responsibility of governing Boards is ensuring rigorous and fair assessment of CEO performance. This can only be achieved if written performance standards/criteria (policies) are in place. This workshop explores a framework for systematic performance evaluation, enabling Boards to fulfill their “duty of oversight” in a manner that improves performance while dramatically reducing the surprises and drama that often cause strife and dysfunctional Board/executive relationships. Three key methods of collecting performance data will be described. Examples will be presented illustrating how the CEO’s written presentation of both policy interpretations and data substantiating policy compliance enable boards to assess performance in a fair way, building the crucial alignment between board and management that is integral to maintaining a strong, trusting relationship and sustainable success. Even highly experienced Board members often have conflicting perceptions as to what the primary job of the governing Board is. When asked, the most common responses include: “strategic planning,” “oversee finances,” “advise staff,” “set policy,” “raise funds,” “ensure customer satisfaction” and even “help out.” This workshop concisely presents what the trusteeship role of the Board is and means, and the three key “products” that should be the core of every governing board’s job description. The three key “job products” of all governing boards. The four key categories of governing policies. Three key methods of performance monitoring. This workshop offers ways to define the roles of the Board, its members and the CEO that strengthen communications, support the Board’s role as visionary leaders, and optimize organizational performance and accountability. Participants will explore the key distinctions between staff and board roles, and how boards can fulfill their role best by focusing particularly on purpose, rather than process, while defining the parameters/boundaries within which the CEO and staff are empowered to operate. Define success in terms of outcomes, not activities. Many of our clients’ attorneys have praised this workshop as an extraordinary way to educate non-attorney board members about their primary legal obligations (Duty of Care, Duty of Oversight, Duty of Loyalty, etc.). Attendees gain an understanding of how breaches of these duties usually occur, and of key steps that can be taken to avoid organizational and personal liability through fulfillment of these responsibilities. Successful teams recognizing the importance of periodic assessment of how well they are performing, and how they may improve. Boards are no different. This workshop provides guidance on the “why”, “when” “what” and “how” of meaningful Board self-evaluation and subsequent performance improvement. Participants learn the four key areas of Board self-assessment, examples of good forms/tools, and the common mistakes made by Boards in this important process. Designed for leadership development programs, employers and other entities encouraging individuals to become leaders on boards of directors, this workshop helps prospective Board members understand what to ask prior to joining a Board, and what to expect once there. 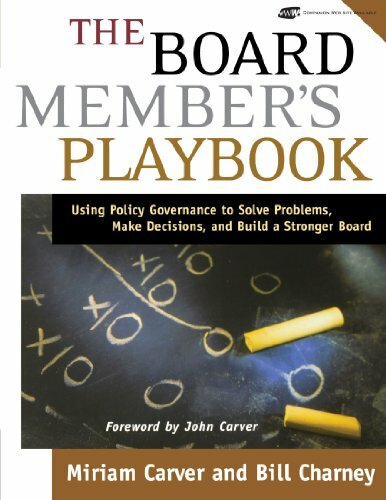 Content includes a checklist of personal considerations, a review of how expectations of Board members have changed post-Sarbanes-Oxley, and an overview of the legal/fiduciary duties of Board members. Chairs and CEOs: Who Leads What? This workshop explains the distinctions between governance and management leadership and the unique needs for the respective positions, with particular focus on viewing the board chair’s role as “CGO” (Chief Governance Officer). Additional information regarding these workshops, and availability of other topics, available on request.